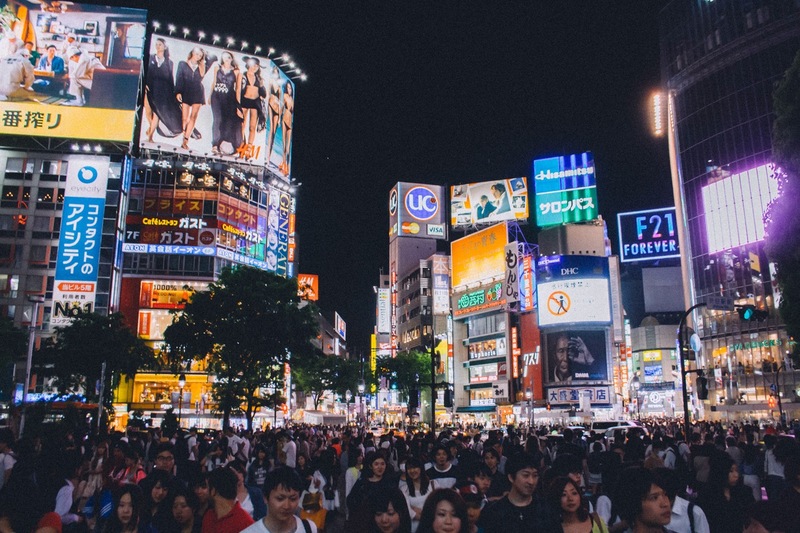 Digital advertising may be glamorous, modern and increasingly important to brand awareness and engagement in a digital age, but research shows that one in five New Zealanders use ad blockers online. With this in mind, does digital advertising still work and if it does, how can you create ads people don't want to block? Why is it that so many people find this visually engaging medium so annoying? 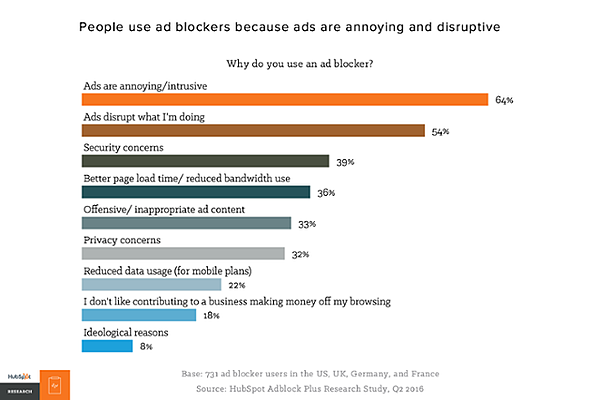 To discover the answer, HubSpot asked people who use an ad blocker service why they do so in the first place. We have to admit that these reasons are completely justified. After all, who hasn't become annoyed when a 5 second advert interrupts the video they're watching on YouTube? Likewise if you find a blog you really want to read, the last thing you want is a pop-up for a download to block your way. Another study revealed that people don't necessarily hate all ads, they just hate bad ads and would prefer to simply remove obnoxious ads from their screens. So then what makes an advertisement 'bad', and what can you do to keep your brand on your audiences' screens? What type of digital ads work best? If you notice the pattern between the advertising which creates the most negativity and the ones that elicit a more positive response, you will see that one category is intrusive and the other involves people opting into the content which results in less intrusion. With adverts like sponsored content, these are typically highly targeted to users who are most likely to find value from those adverts. It's the same with Google advertising popping up at the top of searches, they are relevant based on the words people are using to search therefore people don't mind them so much. But what is most important, is knowing where your ideal personas typically go to look for relevant information. If you know this and place your ads in the most relevant places, they are more likely to find your ads helpful instead of intrusive. It's this type of attitude towards advertising that has lead to the rise of the social media 'influencer'. These individuals will have a following of people that like the content they post on their own social media channels, and can use this reach to influence large groups of people. Brands use these influencers to promote their products in a more natural and organic fashion. And with 49% of consumers depending on influencer recommendations, it's really an advertising channel that is taking off. In general terms people are getting tired of advertising streams that interrupt them and shouts a message at them. Instead consumers are engaging with promotional formats that show them products they have elected to learn more about, or are from sources that have established trust or shared interests. Consumers are getting better and better at zoning out the noise. Users will even ignore areas on a website that they suspect will contains adverts. This is why you need to create ads that are helpful to your audience. How do I create engaging digital ads? Now that you know the type of digital ads that don't work, crafting ones that do work should be easier. For a start it helps if you understand who you're talking to - your buyer persona. Knowing this person, their challenges, where they go for information, and what they like to see will help you capture their attention with helpful content. Instead of promoting a one-way message to them (shouting your latest offer), use digital advertising to offer them a thought starter. Promote a blog article relevant to their challenges, a guide that showcases a solution, or some other value-added content to intrigue them and provide value. Instead of thinking of digital advertising as an outbound marketing activity, use digital advertising to reach your ideal audience with your inbound marketing tactics (your content). The below example does exactly that. 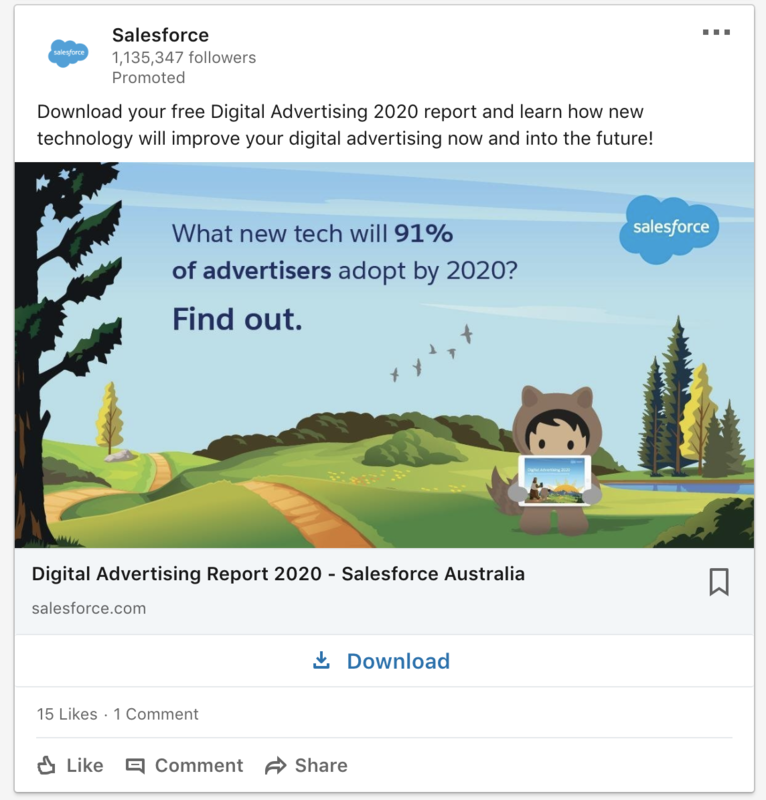 Salesforce use digital advertising to get their existing inbound marketing content (the report) in front of a targeted audience that will find this offer extremely valuable. By linking advertising to gated content (content hidden behind forms) you can also measure how effective that advertising was at bringing in new contacts and sales leads. However, be sure to set relevant goals for your ads before creating them, as this will help you measure how effective they are as you go. In summary, to create effective digital ads you will need to have a thorough understanding of your personas and the content you will need to provide real value for them. Don't try a 'one size fits all' approach and launch your ads on every channel possible. Do your research, and choose the channels where your personas are present and will be the most effective for your brand.